Last year there had been reports of many people getting called by someone claiming to be from the IRS only to be harassed for money they owe and often being threatened. It seems the same scam is occurring this tax season but on a much larger scale and to a much larger group of people. Last year they targeted new immigrants for the most part while they are now calling people everywhere. These fake IRS agents have targeted nearly 366,000 people and over 3,000 people have fallen for the scam. If you think you owe back taxes, hang up and call the IRS at 800-829-1040. If you know you don’t owe taxes, hang up and call the IRS at 800-366-4484 to report the incident. 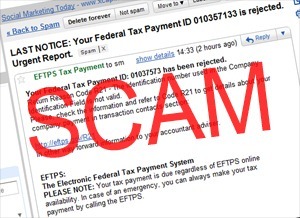 Along with knowing how to handle the situation, the IRS has also released these tips to help avoid the scam. The IRS will never call you about taxes owed without mailing you a notice. The IRS will never demand that you pay taxes without giving you the opportunity to question or appeal the amount the agency says you owe. The IRS will never ask for credit card or debit card numbers over the phone. Consult with your local CPA at Cartlidge, Cartlidge & Co. if you have questions regarding tax scams.